In honor of the ladies in this book club - who are all retired - I decided to (temporarily) retire from coming up with "clever" (yes, I know - depends on your definition) titles for these book club posts. 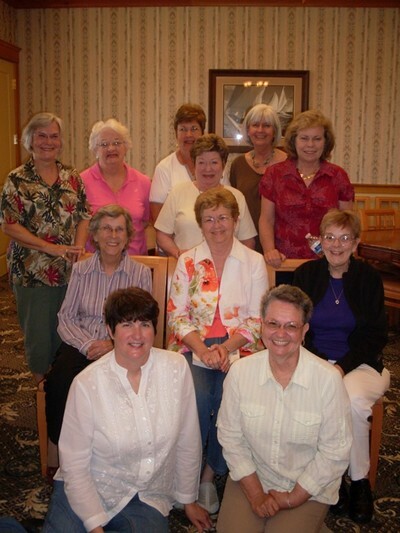 TOP ROW Left to right: Ruth, Peggy, Geraldine, Martie, NEXT ROW DOWN left to right: Marge, Nancy, NEXT ROW DOWN left to right: Betty, Ginny, Alice Jeanne, FRONT ROW left to right: Rita and Sue. This club very appropriately meets in a clubhouse. Unfortunately, they do it on Thursdays in the early afternoons, so alas, no drinks (that I can see, anyway, and believe me, I have eagle-eyes for this sort of thing). Bridgeville is in the southernmost county in Delaware and these ladies live in a 5 year-old community there. Hmm... if I lived in a community where I knew alot of people in the neighborhood, would that disuade me from going out to get the mail in this getup? Nah. I don't think so, either, despite what Tim said when I went out to the mailbox like this, "Say hi to the neighbors. We'll tell them we're adjusting your meds." Thanks again, for a lovely discussion, ladies! I stopped by your blog today - looks like a fun group. This page contains a single entry from the blog posted on May 23, 2010 4:05 PM. The previous post in this blog was KI/SZ Book Club of Sister (and PJ) Princesses!. The next post in this blog is Not Yo Mamma's Book Club.